Who else is going a little stir crazy with this weather? One day it's sunny and we're out for a walk, the next it's freezing rain and we're stuck inside. When we can't get outside, I often find myself scrambling to come up with stimulating indoor activities for the girls. It's always good to have some in your back pocket. 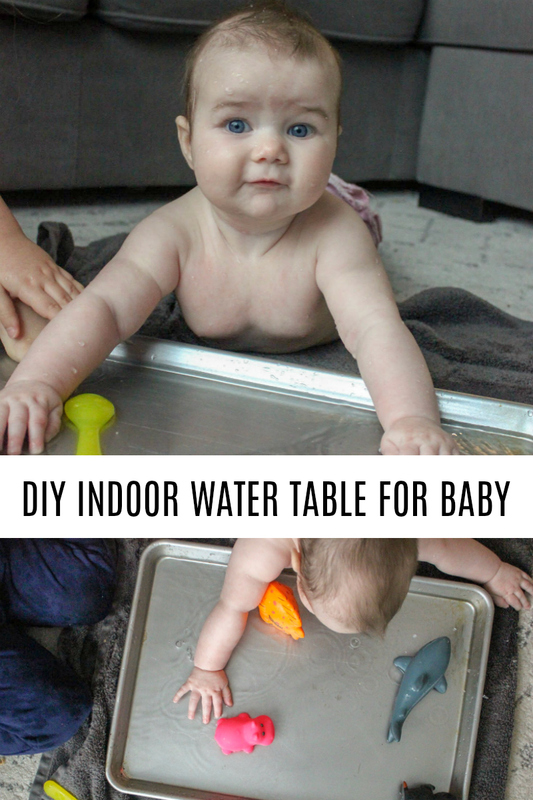 And because you asked (thanks to an IG story poll), over the next few weeks, I'll be sharing my back pocket indoor activities for both babies and toddlers/preschoolers, starting with this DIY Indoor Water Table for Baby! One of my favourite indoor play ideas for the littlest in our family is this DIY indoor water table. I'm a water lover, and have thankfully also passed that on to my girls. Morley often tells me she would like to be a mermaid, that's how much she loves the water. This indoor water table was an activity I often pulled out when she was little, so I figured I'd give it a go again for her water-loving little sister. It's a super simple idea to have in your back pocket when the weather isn't ideal to get outside (or when it is, and you're just looking for something fun) and it can be recreated with materials you very likely already have lying around. So how did little B like it? Of course, it was a hit. Big sis was also loving it, showing B how to splash and grab the toys. 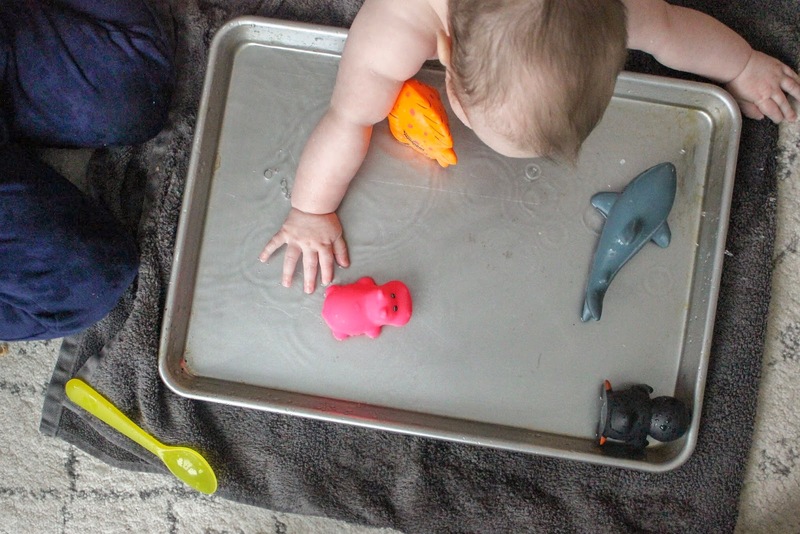 This water play activity is not only fun, but it gives many opportunities to develop fine and gross motor skills (think hand-eye coordination). It's also an amazing sensory experience introducing them to textures and even temperatures. Plus, it's a great way to help get your babe more comfortable around the water (yes, they will get wet) AND to sneak in a little tummy time without them putting up too much of a fuss. 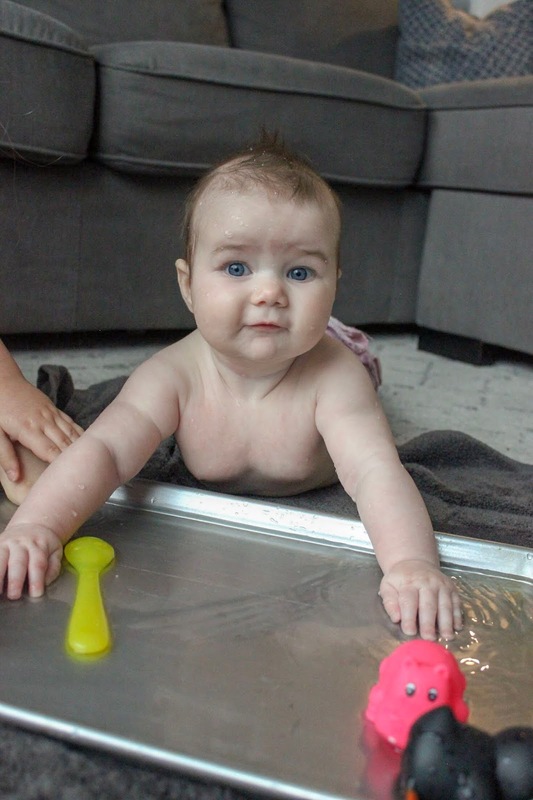 Important note: While I say that this water play activity is good for baby, I recommend only doing it for those that are strong enough to push up on their arms and hold their head up while on their bellies. Place the towel flat on the floor. Put the cookie sheet on top of the towel. Add baby-safe and water-safe items to the water. Place your babe on their tummy, with their arms in the water (so the edge of the cookie sheet is essentially in their armpits). Have fun watching them splash in the water. Important note: Remember to NEVER leave them unattended! What are some of your favourite DIY indoor activities? I'd love to hear!